I had finished my Hawaiian Applique project and needed a new handwork Forever Project™. 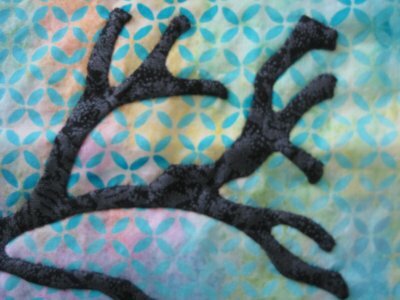 Looking in my pile(s) and list(s) of projects that I really want to do (someday, sometime), I spied a very interesting pattern, Manzanita by Random Threadz. While the overall impression is rather dark and stark, the leafless branches intrigued me nonetheless. As with any new project, I'm also trying to use supplies from my stash. Not that I don't want to support my local stores, but I *do* have All This Fabric and should make an effort to use it. 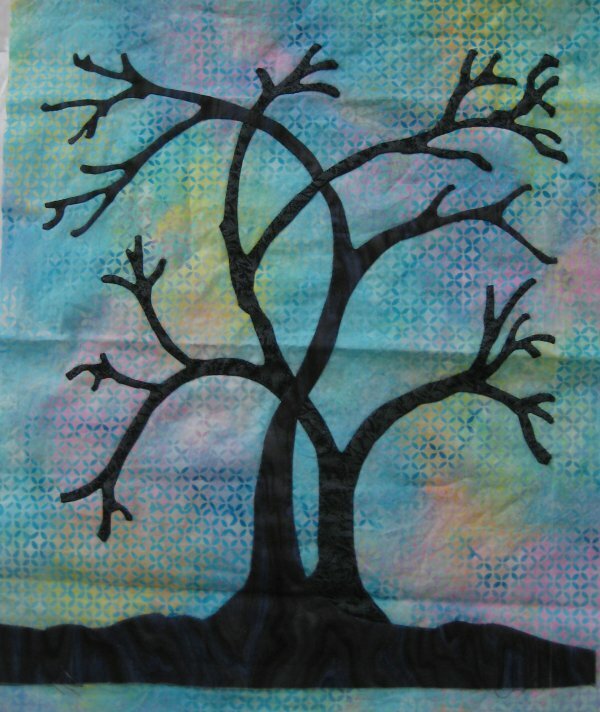 At the beginning of this March, I found two different toned blacks for the tree and a multi-colored batik for the background. Using the front-basted applique technique I learned from Nancy Lee Chong of Pacific Rim Quilting Company, I basted my trees to the batik background and started the applique process. This particular project is small; the finished size is 25"x29". The applique part is only 12"x16". It fits nicely in my Forever Project™ box that I take with me in the car. When I visit with my Dad on Wednesdays, it comes with me and I'm trying to *KEEP* this as a portable, away-from-home project. (If I work on it at home, then I'll finish it in short order and then, not only will I have another top to be quilted but I'll need ANOTHER Forever Project™!). So, progress was going slowly .. but that was OK.
Then, I was watching some TV movies and some TV shows that I had recorded but hadn't watched yet. Generally speaking, I like to be working on some sort of hand-work when watching TV, otherwise I feel as though I'm not being productive. Well, the only hand-work I had available was Manzanita, so out it came. Needless to say, the applique work is now finished. I must say that while it might not be award-winning work, *I* am exceedingly pleased with the overall look of it. I really do love the gnarly and non-symmetrical look of the branches and stubs. I love the little bumps and lumps. Even with the dark fabric, these bare branches somehow feel more "alive" to me than a perfectly symmetrical and perfect design. Now that the hand-work is completed, I have the machine piecing to do .. which means that pretty soon, I'll have another top to put on the pile. This isn't exactly what I had in mind ... while at home, I really do want to work on the List of 17 tops to be quilted and *NOT* add another one to it! Therefore, employing the ostrich head in the sand methodology, I am going to set Manzanita aside for a while. All the fabric and pattern instructions are bundled together so I can easily pick it up again at some future point ... but for now .. into the UFO stack it goes. And .... I now need a new hand-work Forever Project™! I had the next top, from my infamous List of 17, to be quilted when we received an invitation to a family baby shower for one of Mr. Pirate's first cousins once removed. Everything came to a screeching halt whilst I pondered what to make for the baby quilt. I looked through my baby quilt ideas and finalized on a recent addition. Does anyone else waffle over what their NEXT! FAVORITE! project is going to be, based on what you just looked at? It drives me nuts. Anyway, the background is a mosaic of squares. 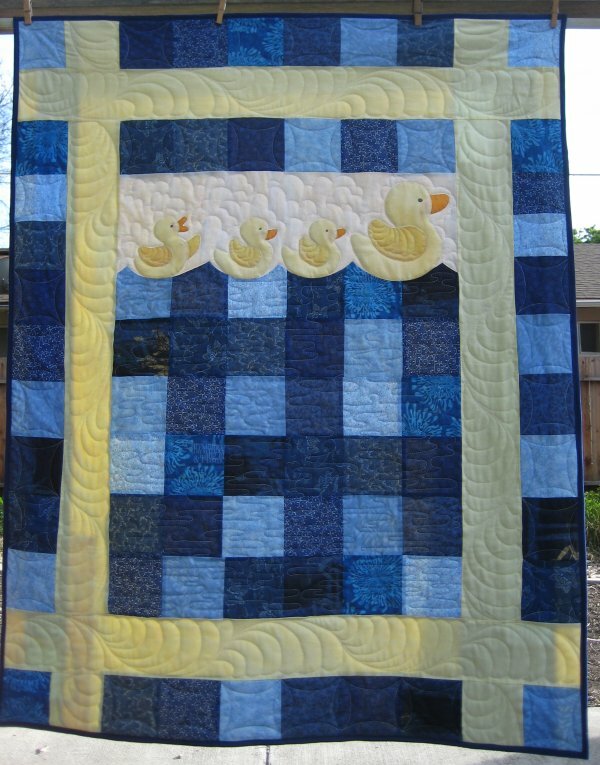 Along the top is a strip with appliqued rubber duckies. All of that is surrounded by a frame and around *that* is another round of squares. For the appliqued duck, I turned under all the edges then did a narrow zigzag (but not a satin stitch) in matching thread to hold the applique one. Looks tidier to me than a fused and edge-stitched raw edge applique. 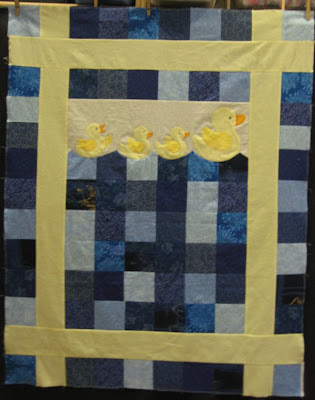 For the quilting, I did a continuous curve in the outer border, feathers in the yellow border and the duck wings, clouds in the sky above the ducks, stitch in the ditch around the ducks and a water ripple in the "water" area. That picture is just a teaser! For all the gory details, links and more pictures, please visit my web page for the Just Ducky quilt. I had a bunch of almost fat quarters, left over from a previous project and realized that I could use most of them up with "Just Ducky", a delightful pattern by Cheri Leffler Designs. The ducks are fused appliques with the raw edges held down by several rows of edge-stitching, which looks rather like a small child outlining a coloring book design. It looks adorable .. but .. I worried about it for two reasons. 1. This quilt was going to be a gift. Raw edge applique, although an intriguing "new" technique, does look unfinished. I would hate for my recipients to think that I was using some slap-dash method. 2. Since this *was* a baby quilt and I haven't done a raw-edge applique design before, I was very concerned that with repeated laundering, the fusible would detach itself, leaving the applique body to "bubble" and that the edge-stitching would come undone. Either scenario would be horribly, horribly embarrassing. So, I decided to machine applique those cute little ducks in place. I turned under the edge and did a very narrow zig-zag in matching thread along the folded edge. Furthermore, I changed up the actual ducks I used. Since I was going to be machine zig-zagging the edge in place, I wanted a smoother edge to work on. The ducks in the pattern have delightful tail feathers, but I wanted a simpler design. I found exactly what I wanted at Quiltmaker; the PDF for the duck appliques can be downloaded here. I'm sure that it took longer to turn under the edges of the applique & zig-zag them down than it would if I had simply fused and edge-stitched the ducks! But, the final result pleases me ... and that makes me happy. I finished the piecing over 1-1/2 days .... as is typically so, I had a LOT of distractions and interruptions whilst I was piecing, so it wasn't a continuous 1-1/2 days. This really is a very easy pattern to do. Now that the top is down, I'll need to go get some appropriate backing. I'm thinking of some flannel with ducks on it .. I'm not sure if this is in vogue these days, so I'll have to see what my local stores have in stock. As for the quilting designs .. preliminarily, I'm thinking of Water Ripple for the patchwork water, some clouds in the sky area and Carla Barrett's "Curly Swirly" in the yellow frame. Hmmmm .. maybe not for the yellow frame. That yellow frame is 4" wide .. certainly wide enough to do something interesting ... maybe the alternating feathers that I recently did on another quilt. But first .. gotta go buy that backing fabric & batting! How things change in a hurry! I have small wall-hanging that I was originally going to use as my April goal for the Lovely Year of Finishes. The top is a needleturn applique. I have the batting and the backing. It's ready to be loaded. But I procrastinated by allowing myself to be distracted by another revived hobby of mine: family genealogy & scanning of family photographs. It was serendipitous that I did procrastinate ... we just got an invitation to a baby shower for a family member! 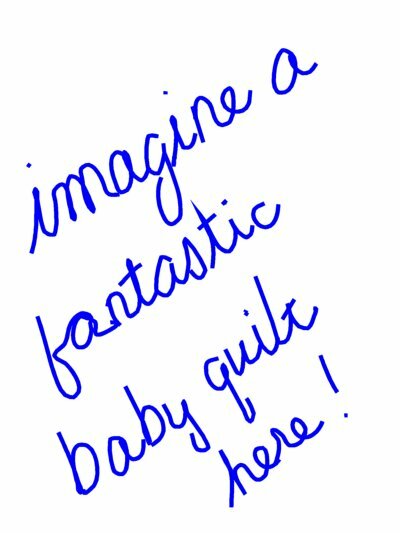 Now, I don't keep baby quilts on hand, so now the push will be to go through the ideas I've filed away for interesting baby quilts, pick one, pull the fabric, piece the top, quilt it, label it and bind it .... all by April 21st! !